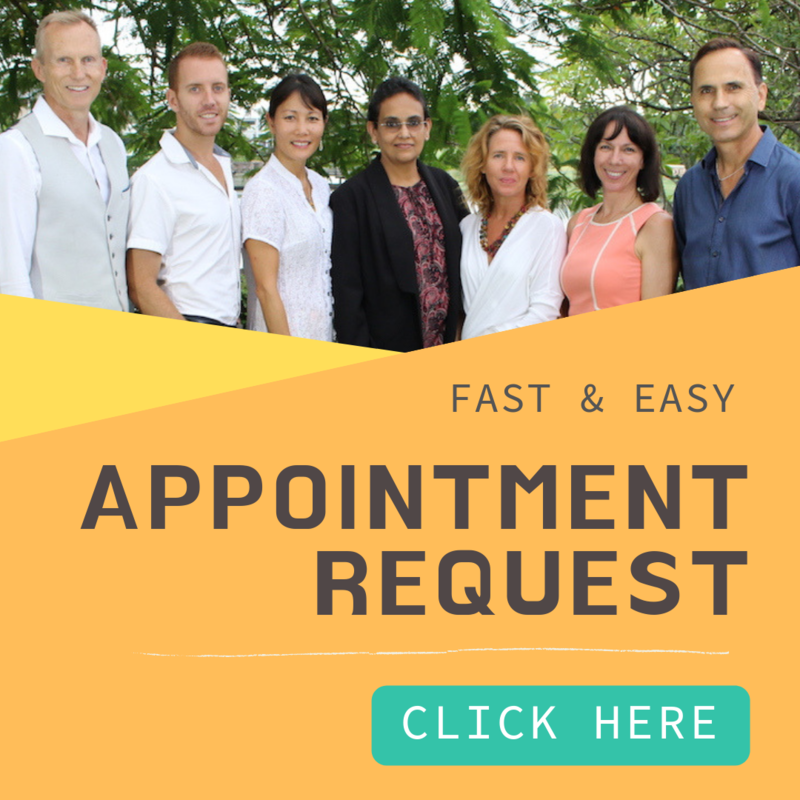 Our body consists of four (4) primary fluid systems, namely: circulatory system, venous system, cerebrospinal fluid (CSF) system and white blood system. These systems are intertwined throughout the body, and each plays a vital role in transporting the mediators of the immune system. Each cell can be given enzyme energy and oxygen, both necessary for regeneration and keeping cells healthy. All other fluid systems have access to our lymphatic fluid system with its elements. “Stress-free” movement is needed to create the enzymes, which activate cellular communication. 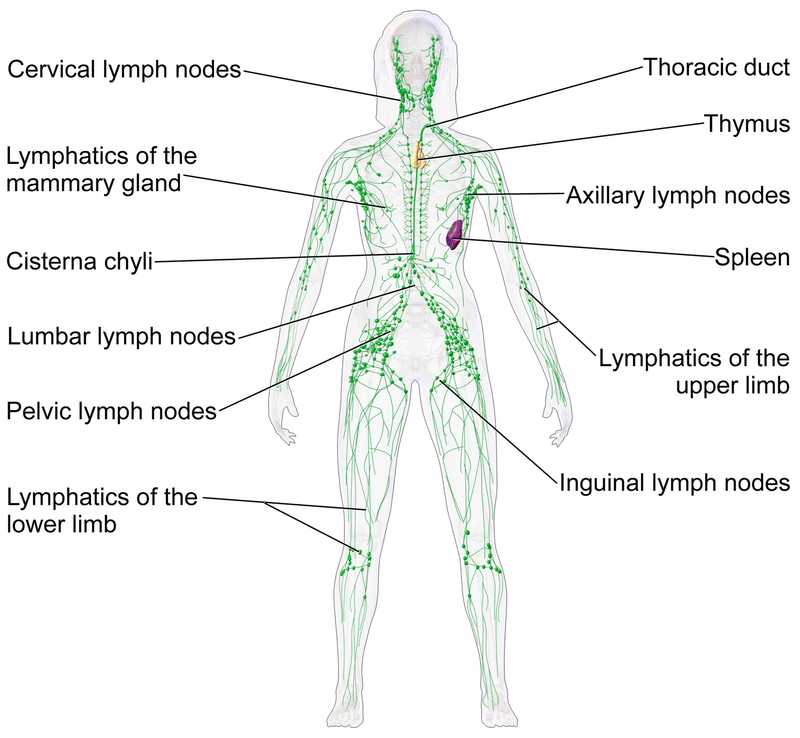 These are only some of the most important responsibilities of the Lymphatic System, which regulates all of life’s synergy processes. If the waste produced by the cells were returned to the blood, or not processed enough, we would suffer from toxaemia, which is blood poisoning. Therefore, the body has to have a system like the White Blood system that removes the cellular waste and gases from our body. This system is known as the venous system, in which the de-oxygenated blood is pumped back to the lungs via the heart, where gases (CO2, etc.) and acids (lactic & uric etc.) are removed, a new lot of oxygen is received from the lungs and nutrients are pumped by the heart plasma. This system extends to every cell, drains away the cellular wastes and returns it to the blood system via our kidneys and liver for purification. The purified blood is then returned to the circulatory system to continue the process. If the lymphatic system becomes slowed in its task of removing the cellular waste, the information will be contaminated and we become unhealthy. Therefore, if we can assist the body in moving the lymph promptly, our health will improve and pain will subside. Now, the critical question is – HOW? Removing toxins from the body can be done in many ways. Eating plenty of fibre and healthy foods can eliminate waste products, as can drinking water. Another way to release toxins on a cellular level is through lymphasicing, or rebounding exercise. Our White Blood System has five times more fluid than the circulatory system. While the heart pumps the blood, what pumps the lymph fluids? MOVEMENT. Lymphasicing provides the proper movement by opening and closing lymph valves, causing movement of lymph fluids throughout the body. Lymphasicing is defined as the use of deceleration, acceleration and gravity to stimulate the cleansing of cells. Rebounding exercise is a great exercise that detoxes down to the cellular level. But how does rebounding exercise cleanse the body? Research reveals that the lymphatic system pumps protein and fluid out on tissue spaces every time they are moved or compressed. When you do rebounding exercise, gravity is eliminated (at the top of the bounce) and your body become weightless for a split second. At the bottom of the bounce, the intensity of gravitational force doubles the Earth’s gravity, causing pressure on your internal organs. This pressure within the cells increases, and waste materials get squeezed out. Another benefit of rebounding exercise is that it promotes lymphatic drainage. Your body has more lymph fluid than blood, and since there’s no organ (like the heart) to push lymph through the body, the process is dependent on muscular activity, deep breathing and gravitational pressure for proper circulation. 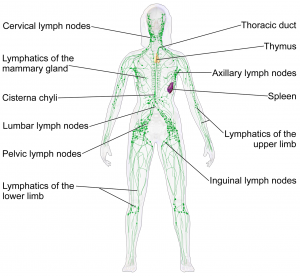 When you lymphasise, your lymphatic valves shut (at the bottom of the bounce) and open (when at the top), pushing lymph fluids throughout the body. While any movement can help the lymphatic system flush out toxins in the lymph, rebounding exercise is by far the most effective when it comes to draining toxins and increasing lymph flow. Daily rebounding can be a gentle detox technique. 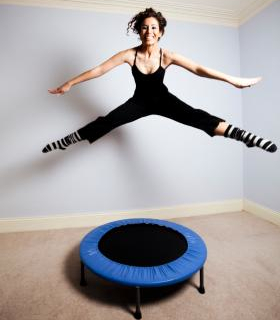 Once only a kid’s toy, the rebounder, also known as the mini-trampoline, has now become a piece of fitness training equipment. In fact, NASA revealed that exercising on a rebounder reduces joint stress by 40% compared to exercising on the ground, without any difference in the calories burned. Health Bounce – this is a gentle, low impact rebounding exercise, and highly effective in moving your white blood system and stimulating your immune system. You can simply bounce up and down on the lymphasiser without your feet leaving the fabric. You can do this while watching TV. Strength Bounce – this requires higher bouncing with both feet leaving the mat. Jump as high as you can to strengthen and stabilise muscles all over your body, move your lymphatic system and improve your balance. Aerobic Bounce – this involves different exercise to elevate the heart rate. It could be jumping jacks, running in place, twisting to trim down the belly and any other movements you can think of. Don’t wear constricting, tight clothing. Leave a bit of looseness for your skin and muscles to jiggle. The more jiggle, the more toxins are flushed out! So prepare those baggy jogging pants, put on some upbeat music and have fun rebounding. Before you start, tailor your rebounding exercise to your situation. I suggest beginning with a slow-to-moderate pace so you’ll breathe a little faster, but not uncomfortably. You don’t need to jump high, simply bounce up and down without leaving the lymphasiser. For detox/cleanse support, do it for at least 15 minutes every day. If possible, do three 5-minutes sessions daily. Do not do rebounding exercise right after eating. Breathe deeply while lymphasising to keep your body functioning. Not breathing deeply can make you tired easily and also can develop varicose veins. Drink clean, warm water beforehand. This will create movement of fluid throughout your body to get your white blood system moving. Do it outside, get sunlight and connect with nature. After doing rebounding exercise, you may feel a slight light-headedness – a sign that your body is removing toxins. At this point, stop. You can do it for longer periods with time. While doing this exercise, focus your mind on cleansing your cells, washing them and purifying them to help release the toxins.